Matt Teske is a graphic designer, electric car advocate, and marketing expert who lives in Portland, Oregon. 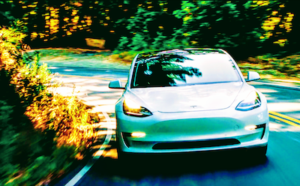 He thinks one of the factors holding back the EV revolution is that buyers and sales people are confused by all the new terms that apply to the electric car experience. Kilowatts, kilowatt hours, volts, amps, fast charging, Level 2, CCS, CHAdeMO, Supercharger — it’s a lot to absorb. To address those issues, he has created Chargeway, a system of simple graphics that make electric car charging easy for everyone to understand. Confusion often leads to indecision which leads to putting off a buying decision until some unspecified time in the future. Some people who think they want to buy an electric car may choose to buy a conventional car instead because it’s easier to deal with the known than the unknown. Familiarity brings with it a comfort level that is often missing with new technology. Teske’s system uses numbers and colors to take the mystery out of shopping for an electric car. Engineers and techies may enjoy bantering about abstruse concepts. Regular folks just want to know where they can plug in and how long they will have to wait before they can unplug and continue driving. We don’t need to understand the theories of André-Marie Ampère to use a microwave, for instance. Teske’s system accommodates all current charging standards and can be easily modified to include new standards when and if they become available. 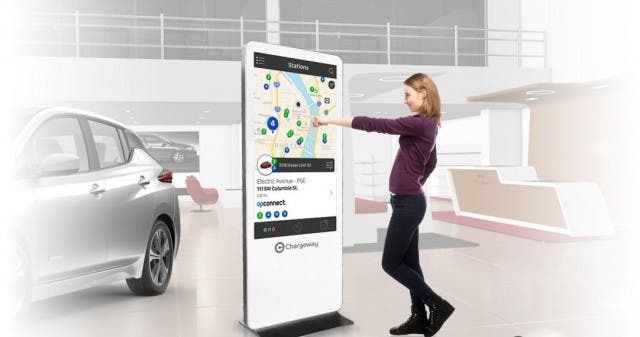 All that information is displayed on a large kiosk-type graphic car dealers can use in their showrooms to simplify the charging process and make it more understandable to both consumers and sales people. Teske believes his Chargeway system has important advantages for everyone involved in buying or selling electric cars. Drivers get a simpler way to filter an app that locates charging stations, without having to know the jargon, names, and ratings of the different standards. Sales staff desperately need to understand “electric fuel” to explain easily and simply to mass-market buyers how the cars can be charged. 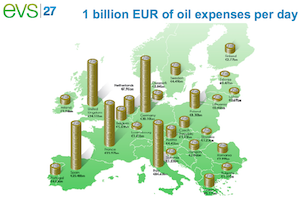 Utility companies get a much easier way to explain to their customers why they should consider “fueling” their next vehicle not with liquid hydrocarbons but with plug electricity. 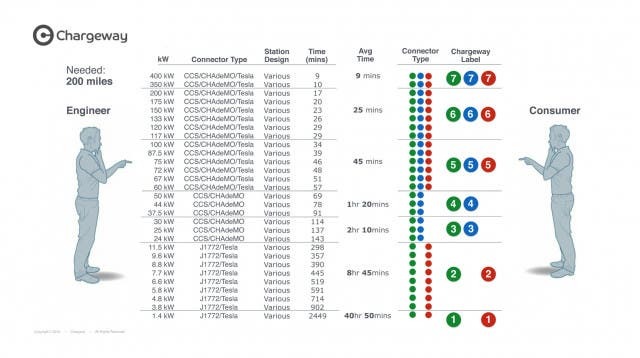 Charging networks get a simple, universal, and easy-to-implement labeling system that all drivers will come to associate over time with electric-car charging. Teska tells Green Car Reports his Chargeway system is getting lots of attention from all stakeholders. The Oregon Department of Transportation will begin using the Chargeway system along the I-84 and I-5 corridors later this year. The state’s automobile dealers association has signed on to the project. Utility companies are also getting involved. Pacific Power and Portland General Electric will utilize the Chargeway program to boost electric car acceptance among their customers. 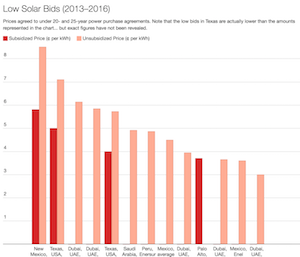 After all, utilities sell electricity. 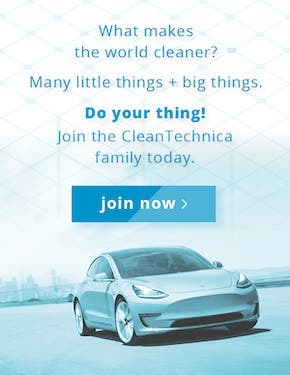 Why wouldn’t they be promoting the idea of driving electric cars? “An electric car drives just like any other car on the road. The only difference is how you fuel it. Chargeway now makes that easy for everyone to understand,” Teske says. 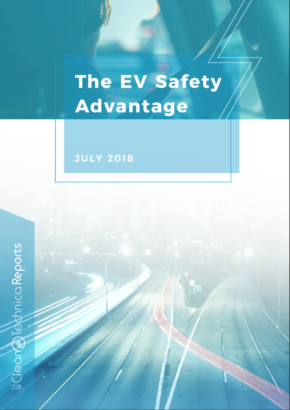 By taking the mystery out of driving electric, Teske and Chargeway are making an important contribution to the electric car revolution.